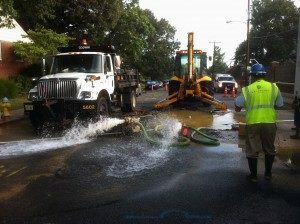 Arlington County crews have been working around the clock to repair a number of water main breaks across the County. Between December 11 and January 11, crews repaired sixty seven (67) water main breaks in freezing temperatures. The temperature fluctuations create stress on our water infrastructure making them more susceptible to breaks. Crews work as quickly as possible to repair and restore water to residents. To report a main break or water-related issue, please call our 24-hour Water Control Center at 703-228-6555. If you are unable to get in contact with a Water Control Center representative, then as an alternative you can call Arlington County’s public safety (police/fire) non-emergency line at 703-558-2222. Check out our interactive map of water main breaks from Nov. 1—Jan. 11. For additional information, visit Arlington’s Water & Utilities webpage. Many services saw higher satisfaction than in the last survey in 2015, while others are in need of improvement. Stay Informed. Plan Ahead. Make a Kit. Learn the steps you can take before the arrival of Hurricane Florence.